While I enjoy all my aikido classes, I particularly enjoy the classes involving weapons training. Not because I seriously expect to be involved in a sword fight any time soon (although you never know), but because training with weapons teaches you lessons about aikido, your body, and life in ways nothing else can. A quick note of explanation: Aikido is a Japanese martial art that emphasizes redirecting the force of an attack rather than opposing it head-on. 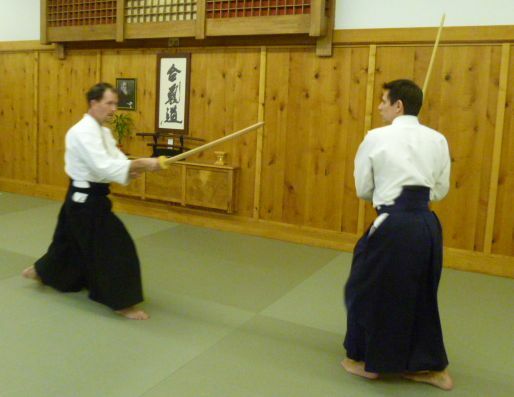 While most classes focus on empty-hand techniques, we also train with three types of weapons: bokken (wooden sword), jo (short staff), and tanto (knife). One of the lessons weapons training teaches is that a weapon is just a tool. It doesn’t do the work for you and it doesn’t guarantee victory. A person with a knife can defeat an attacker with a sword. An unarmed person can disarm an attacker wielding a knife. A fight between combatants using sword and staff can go either way. What matters is not the weapon, but the person. What does this mean to you? It means that when it comes to your sales, your greatest weapon is yourself. Your competitors may have bigger marketing budgets, more sophisticated CRM systems, nicer brochures, even better quality products. That doesn’t matter anywhere near as much as you might think it does. Just because they have more and better sales weapons than you do, doesn’t mean you can’t win when you go head-to-head against them. What I’ve discovered over decades of selling, researching and training is that the sale doesn’t necessarily go to the lowest price, the best quality, or the largest company. It typically goes to the best salesperson. I’m not saying it isn’t helpful to have lots of great sales tools to work with. But even the best tools, like weapons, are useless and even dangerous if not used effectively. 1. Have confidence in yourself, your company, and your product or service. Confidence is contagious, and it’s a major reason people buy. The sharper your sales skills and the stronger your belief in yourself, the more sales you’ll make. Because in the battleground that is the marketplace, the most important weapon you have is you. Looking for sales training resources? Click here. 1. It provides visual proof you’re listening. Prospects want to be heard and understood. And too many salespeople don’t listen well. When you’re jotting down notes, they know you’re paying attention. 2. It makes you look professional. What kinds of people regularly take notes in their job? Doctors, lawyers, accountants, therapists—in other words, professionals. Professionals take notes. You take notes, therefore, you’re a professional. 3. You have a written record to refer to. You can remind yourself of important names, numbers, dates and other facts long after the initial conversation, making your follow-up easier and more thorough. 4. It helps prevent the “I didn’t say that” tactic. When prospects know you’re writing down what they’re saying, they’re less likely to claim they didn’t say something later on. That keeps the process honest, making your job easier. 5. It improves your memory. The physical act of writing enhances the brain’s ability to process, store and recall information at hand. As you get more practiced in note-taking, you’ll be amazed at how much more you remember. 6. Your notes can spark additional questions or ideas. Reviewing your notes after the conversation can enable you to make connections you previously missed and trigger questions that didn’t occur to you at the time. This gives you a great reason to follow up later with meaningful questions and valuable ideas. 7. It makes prospects feel important. When you take notes, prospects often infer that if you’re writing it down, what they’re saying must be important. Which causes them feel important. 8. It shows you’re human. With a few remarkable exceptions, none of us have perfect memories. 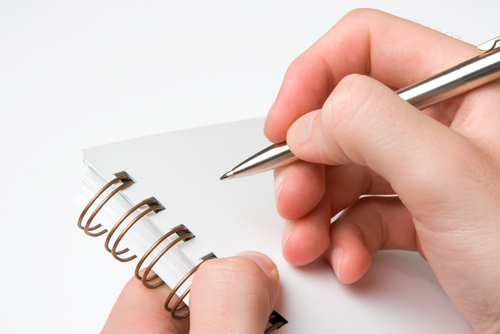 The act of taking notes is a physical acknowledgement of this fact, making you come across as more human. This in turn helps your prospect to feel more comfortable. And the more comfortable they are, the closer they are to buying. So grab a notepad or a tablet—I recommend a notepad, so your prospects know you’re not really checking your e-mail or updating your Facebook status—and start taking notes whenever you talk with a prospect. 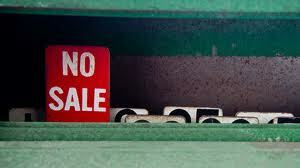 It’s a simple act that can make a big difference in your sales. Not every sales presentation ends in a sale. But that doesn’t mean all is lost. Listen to my appearance on Breakthrough Business Strategies Radio with Michele Price. In this eleven-minute segment, you’ll discover five specific actions you can take to boost your chances of making the sale. To learn more about Michele Price and listen to her interview other business experts on Breakthrough Business Strategies Radio (which I absolutely recommend), check out www.WhoIsMichelePrice.com.